This is another family favorite that we serve every Christmas eve as well as year round. My grandmother on my father’s side taught my mom how to make traditional Maryland Style Crab Cakes. For years, my mother made crab cakes and as our family grew, the number of crab cakes she needed to make became overwhelming. So, one day she just decided to try it as a casserole and it was amazing. At first, the recipe stayed exactly as she would make the crab cakes. Slowly but surely, my Dad and I started making slight adjustments. Those adjustments are listed as optional so you can choose how you want to make it. The thing to remember is to use blue crab meat if possible. 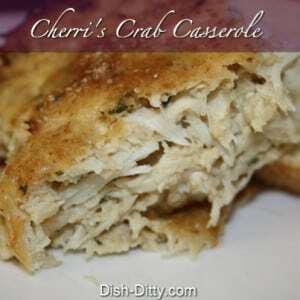 Ok, it doesn’t have to be blue crab meat, we use dungeness crab meat in this recipe all the time. But it really is best made with the sweet and tender blue crab meat. 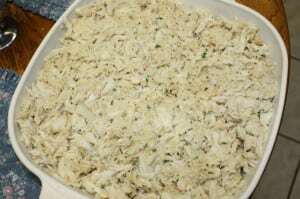 You can buy canned blue crab meat at most grocery stores, but you’ll find that you can find the best prices at warehouse stores like Costco or Sam’s Club. It will be in the refrigerated section. 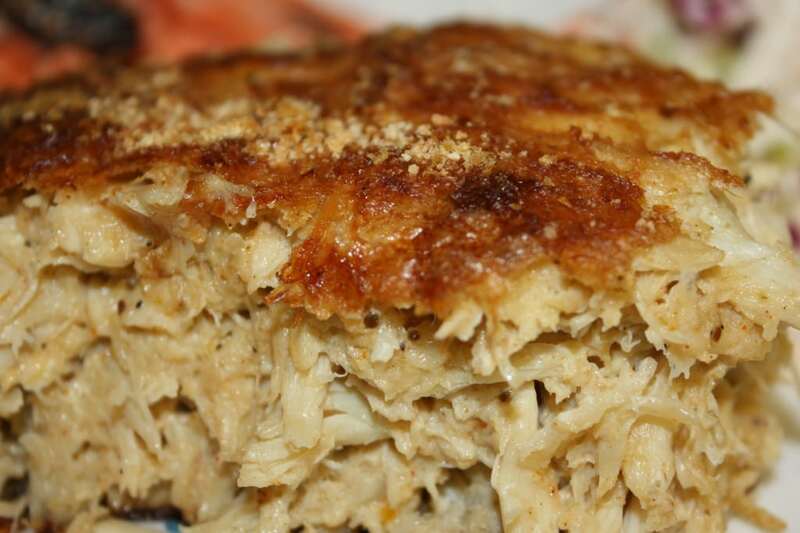 Sometimes you’ll find Phillips Canned Blue Crab meat or Chicken of the Sea Canned Blue Crab meat. Jumbo Lump Meat or Back Fin is the best to use, but you can use less expensive meats like claw or even special. 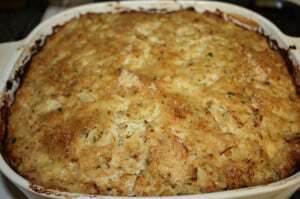 But just remember that lump will just give you large clumps of crab, making the casserole more delectable. So, try this at your next family gathering instead of Crab cakes and everyone will be asking you for the recipe. This is another family favorite that we serve every Christmas eve as well as year round. 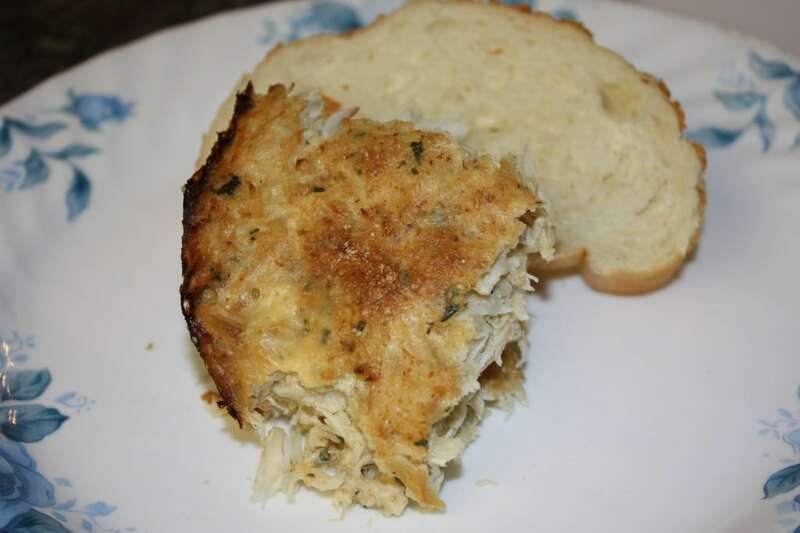 My grandmother on my father's side taught my mom how to make traditional Maryland Style Crab Cakes. For years, my mother made crab cakes and as our family grew, the number of crab cakes she needed to make became overwhelming. So, one day she just decided to try it as a casserole and it was amazing. If you are using crab meat from fresh steamed crabs that were steamed Maryland style with Old Bay, omit the old bay from this recipe or it will become too salty and over spiced. 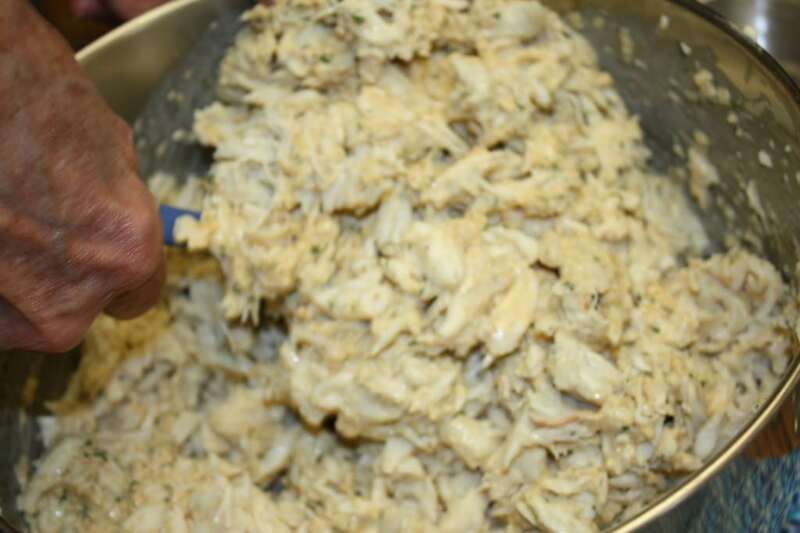 When using fresh picked crab meat, the moisture level may vary. You may need to add more milk or mayonnaise if the mixture doesn't feel "wet". It should not feel dry Or, if it is very moist, omit the milk. How to reheat leftovers: When you have leftovers, you want to be careful how you reheat them. You can heat it in the microwave, but my favorite way to reheat leftover crab casserole is to use a ramekin: spray ramekin with Pam, add crab, add 1 Tbl milk and bake at 350 degrees for about 10-15 minutes, or until hot. Preheat oven to 375 degrees. 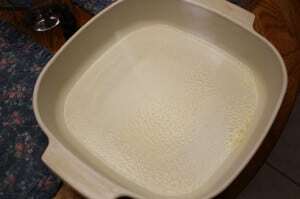 Prepare baking dish by spraying with Pam. 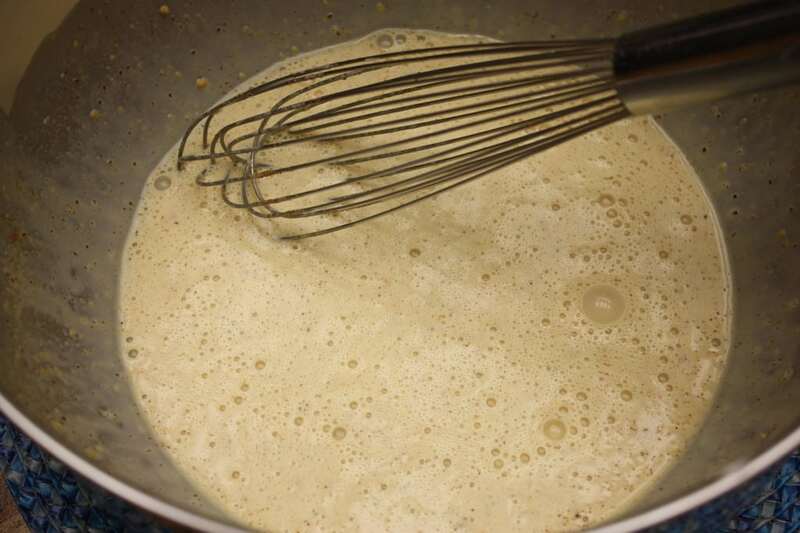 In a large bowl, using a whisk, whisk the eggs, 1/4 cup milk and mayonnaise together. 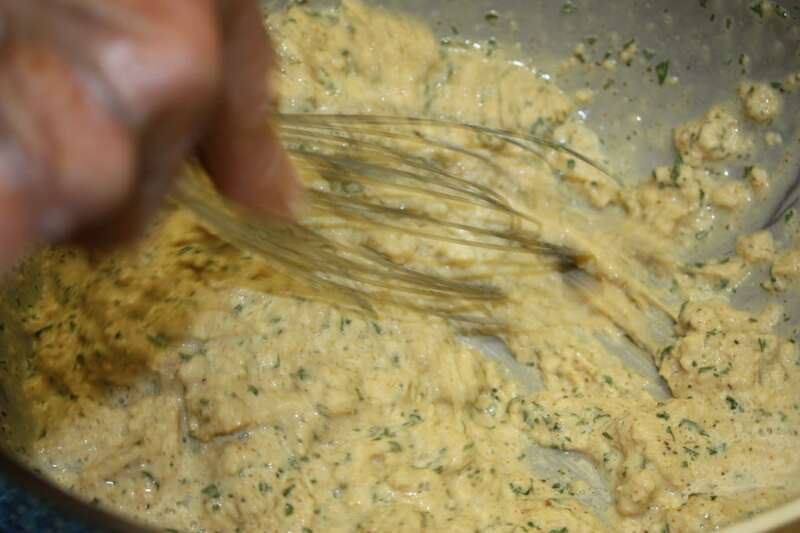 Add each dry ingredient one at a time, whisking together after each addition: old bay, dry mustard, cayenne pepper, baking powder, and dry parsley (everything except the bread, crab, extra milk and breadcrumbs). At this time, you will have a creamy mixture ready for the next step. 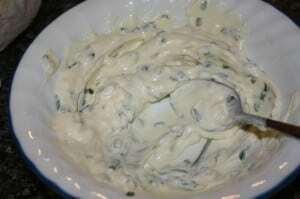 Take the bread pieces and mix thoroughly into the mayonnaise mixture by whisking it. The bread will not be recognizable at this point. Next, be very careful and FOLD in the crab. When I say FOLD, I do not mean mash the crab into the sauce. Just lightly fold the crab in with the mayonnaise mixture. You should not think of this as "stirring" or "mixing". Be sure not to over mix. You should not disturb the lumps of crab, JUST FOLD. Place crab mixture into baking dish. Pour the extra 1/2 cup milk over the casserole and sprinkle breadcrumbs on the top of the crab. Cover and bake for about 45 minutes. Remove the cover and bake for another 20 - 30 minutes or until the casserole is light brown and the center is no longer liquid and bubbling. For a thicker casserole, increase the cooking time with the lid on. Test to make sure the casserole is done. It should be lightly browned on top but not be bubbly. If it's bubbly that means the liquid has not been cooked thoroughly. Think of it like a cake, it shouldn't be wet. Remove from oven and let it rest for about 5 minutes. Serve with your favorite side dishes like coleslaw. I like to eat it on a roll with chive mayonnaise and sliced tomatoes. 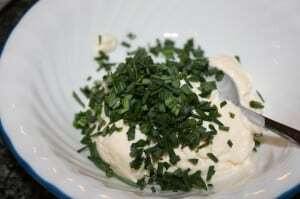 Serve chive mayonnaise with your favorite seafood dishes. 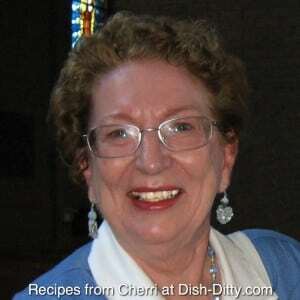 I like it with crab cakes, salmon patties, crab casserole, and any steamed fish. Use it instead of tartar sauce. You need steps? Just mix it together. 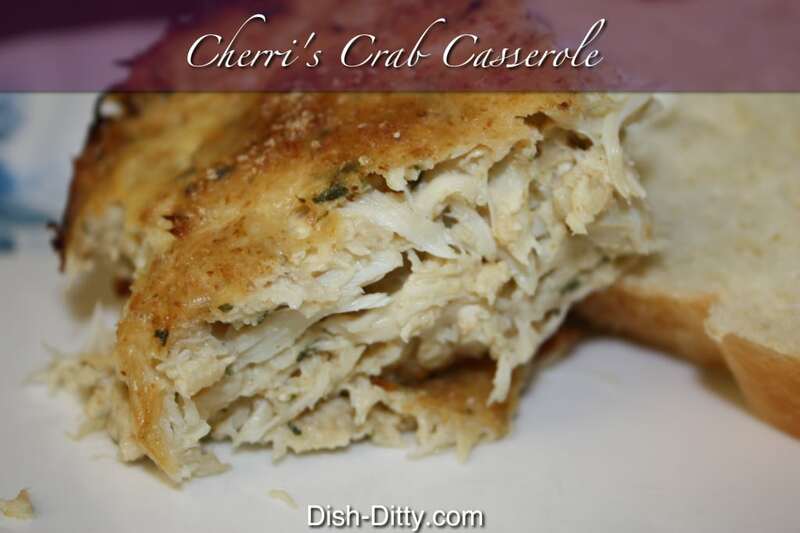 3 Replies to "Cherri's Crab Casserole Recipe"
Sorry about that. I updated it. The optional ingredients are the milk and baking powder. It will make it rise and be more like a soufflé.